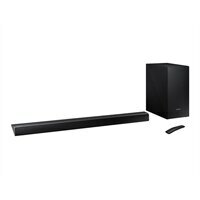 Samsung HW-N450 - Sound bar system - for home theater - 2.1-channel - Wireless - Bluetooth - 320 Watt (total) - BlackGo beyond what you see, and experience more powerful sound with clear tones and deep bass. Pairs seamlessly with your Samsung TV. Go beyond what you see, and experience more powerful sound with clear tones and deep bass. Pairs seamlessly with your Samsung TV.